Longtime 'Charlie Hebdo' Cartoonist Announces He's Quitting : The Two-Way "I will no longer be Charlie Hebdo, but I will always be Charlie," says Renald Luzier, the cartoonist known as Luz. 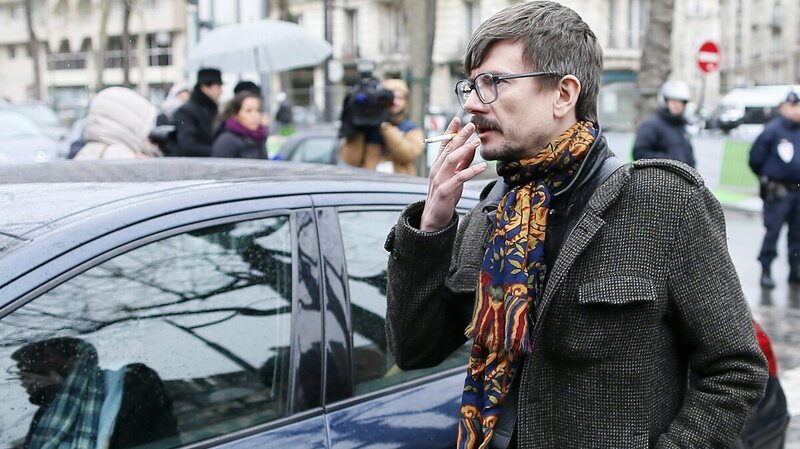 French cartoonist Luz, seen here in January, says he will leave the satirical magazine Charlie Hebdo this fall. The cartoonist who drew the image of the Prophet Muhammad that appeared on the comeback issue of Charlie Hebdo is leaving the satirical magazine, citing stress and a lack of inspiration. The cartoonist, Luz, was one of the few artists who survived January's attack on the magazine's office in Paris. "I will no longer be Charlie Hebdo, but I will always be Charlie," said Luz. The cartoonist, whose name is Renald Luzier and who joined the weekly magazine in 1992, says he'll leave in September. He made his departure official in an interview with the newspaper Liberation. "It's a very personal choice," Luz tells Liberation. He later added, "It became one of my obsessions after all this craziness to rebuild myself, to retake control of myself." Luz also said he has spent sleepless nights wondering about the work that his dead colleagues would have produced. Five cartoonists were among the 12 people who died in the Jan. 7 attack on Charlie Hebdo. One week after the assault, a new issue of Charlie Hebdo became an international sensation, depicting the Prophet Muhammad shedding a tear and holding a sign reading: "Je Suis Charlie." Above him, the headline announced: "Tout Est Pardonné" (All Is Forgiven). Many people have urged him to keep working at the magazine, Luz told Liberation, "but they forget that the worry is the inspiration." Without it, he said, there can be no originality. This week, the cartoonist is also releasing Catharsis, a "therapeutic book" that compiles his drawings and thoughts from the days and weeks after the attack.